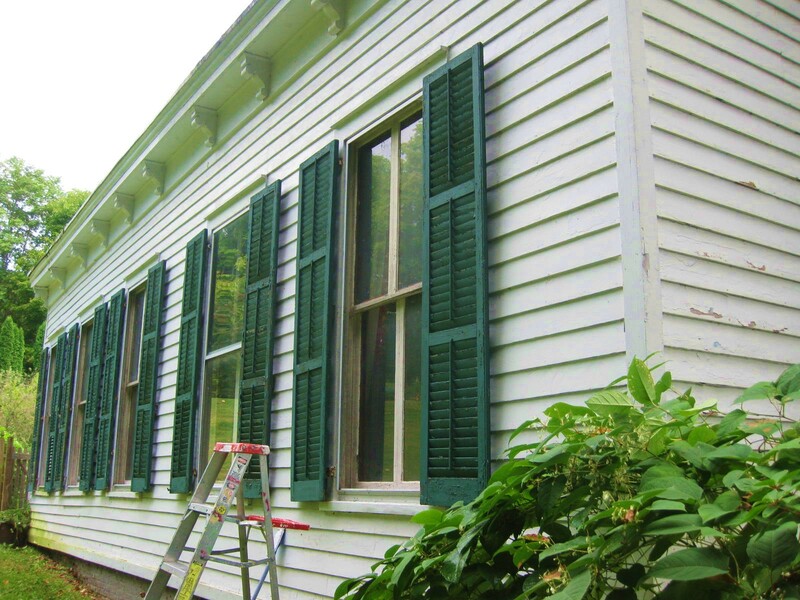 CAN YOU GUESS who cleans the 57 windows in this old house? Well, I do. And I’ve become pretty proficient at it, too. My technique is similar to that of professional cleaning services, in that I accomplish the job with neither newspapers nor paper towels. 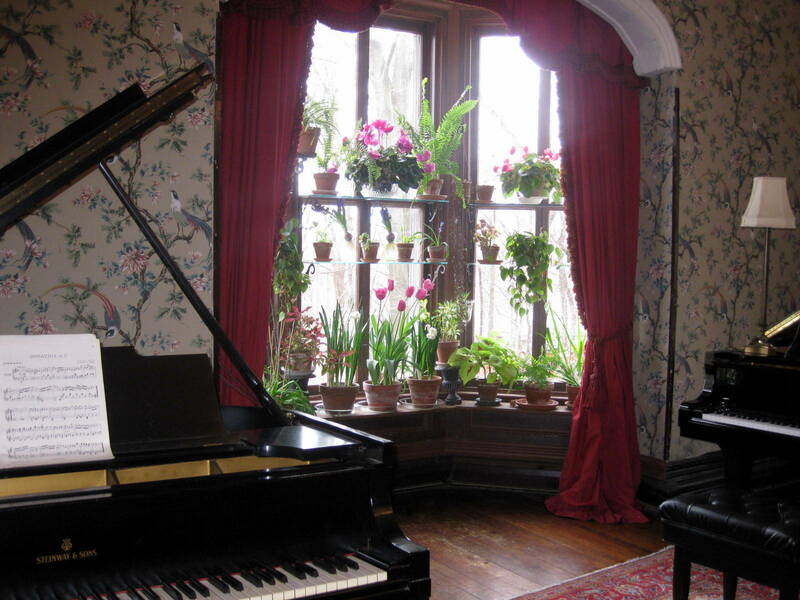 Unlike modern exposures, which can be tilted inward for easy cleaning, my windows are old-fashioned, double-hung types. They open and close on a rope-and-weight system. The glass itself is 186 years old, which means it is bubbly and wavy. Yes, old-house windows are bursting with character. Here in New York’s Hudson Valley, the best time for window work is in late September or early- to mid-October. The pollen has settled by then, meaning one’s cleaning efforts are not practiced in vain. 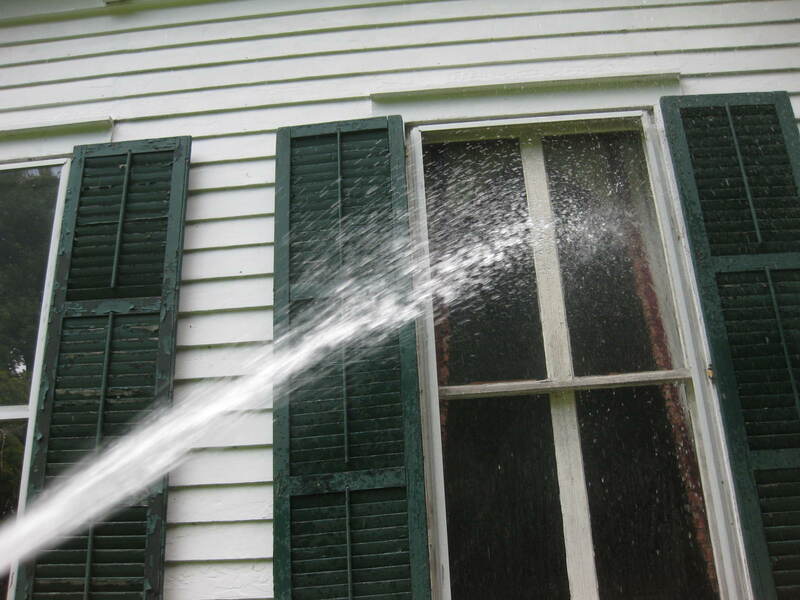 Using the garden hose with a spray-nozzle attached, give each window a firm blast of water. The water will loosen much of the dirt, and prepare the glass for the soap-opera to follow. And speaking of soap operas, I’m hooked on “Mad Men.” What about you? Back to the windows. In the past, I’ve used a soapy solution composed of 45% water, 45% rubbing alcohol, and 10% sudsy ammonia. I can tell you this formula works extremely well, and leaves the windows sparkling clean. Outdoors, the solution is easily applied with a common sponge mop. This year, however, I’m testing a special mop made by Windex. The mop has an extendable handle (which is still too short to reach my tall windows without a ladder). It features a cleaning-pad that’s impregnated with ammonia and various surfactants. One pad, according to Windex, is good for 20 windows. I assume the claim refers to “normal” windows, not extra-tall exposures like mine. Replacement pads are available at supermarkets and hardware stores. So far I’m happy with the product. You can purchase it here. Will vinegar clean windows? Well, maybe it will clean yours, if they aren’t particularly dirty. But it certainly won’t clean mine. Speaking from experience, vinegar isn’t an effective grime-cutter. To remove the soap, give the window another firm spray of water. The washing-solution, be it the Windex mop-version, or the homemade formula, will rinse away without leaving any streaks. Both solutions are fast-drying, too. Should you spot any paint-dribbles on a window, as I sometimes do, you’ll find that a straight-edge razor blade will remove them effortlessly. 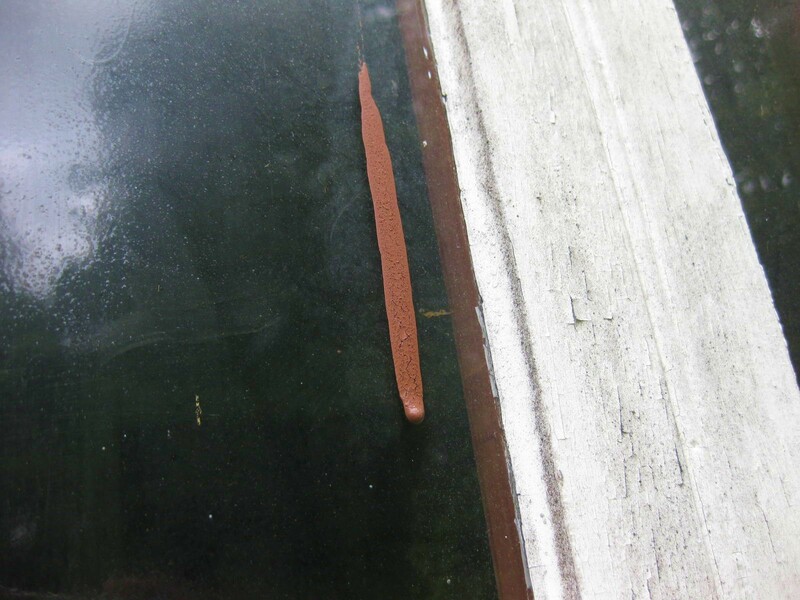 Just hold the blade flush against the glass, and it will peel off the paint without scratching your window. A razor will remove cellophane tape and its residue, too. I keep such razors in a small box in my cleaning-arsenal. Shall we tackle the inside glass? Spray the window with the cleaner, and let it sit for a few seconds to break down the gunk. Then, using a squeegee, make a horizontal swipe across the top of the window. This will eliminate most drips and drops. Next, swipe vertically, until you reach the bottom of the window. In between swipes, wipe the squeegee’s rubber blade on a piece of terry cloth. If done correctly, there will be no smudges or streaks on the window, and you won’t need paper towels or newspaper to produce the shine you want. Use the same terry cloth to wipe up any solution which has gathered along the latch ledge or the sill. And how do I access the windows on the second floor? For these, I climb out of a bedroom window and stand on the porch ceiling. The windows receive the ammonia-water and squeegee treatment. As for for the second floor and attic windows in the back of the house, which have no landing below them, my only option is to attack them with a high-velocity power-washer. I rent such a gadget from my local hardware store. A half-day’s rental is hardly expensive. These windows don’t come out as clean as the soaped-up or ammonia-ized ones, but they get clean enough. Now, I won’t pretend that window-cleaning is my idea of a good time. But on the other hand, I refuse to go through winter with dirty windows. I want sunlight to flood my rooms unhindered, and so do my myriad houseplants. Now, my inquiring mind would like to know: Do you clean your own windows, or do you hire the job out? You can let me know by leaving a comment. I clean mine or occasionally rope in my 19 year old son. I’d like to know what sudsy ammonia is? I have plain ammonia, is there something added to it? I ask because my windows don’t come clean easily and I’d like to try your mixture. Thanks for showing your beautiful windows. stamperitis – Parson’s and other companies make sudsy ammonia. My supermarket sells it, and I’ve also seen it at hardware stores. Sudsy ammonia contains soap, so it’s better for tough cleaning jobs. And thanks for commenting on my windows. I like them, too, although they are not so easy to clean as the modern, tilt-able windows I had in my NYC apartment. I am embarrassed to say I have not cleaned my entire house of windows in 8 years. Living alone in an old house similar to yours, it is so time consuming that it gets left. I clean the insides every time I heavy clean a room, but the outsides….well, they suffer. Thank you for sharing your method, I am going to give it a try. I actually own a pressure washer, so can utilise that, though I really would like to get them sparkly if I am going to do it. Have you ever used the commercial house/window spray wash?? Your home is beautiful, I am envious of the work you have been able to put into it. I’m going back to this way of washing windows. I don’t know why I stopped doing it this way in the first place. Maybe it was the ordeal of dragging a hose from faucet to faucet, and really that’s no excuse, because we have many faucet’s on the outside of the house. Maybe it was my window cleaning solution. Who knows? You’ve got me all inspired now. I live in a new house with tilt-in windows. However I have fond (?) memories of helping my mom. She would be outside and me in, one would wipe side to side, the other up and down. That way if there were any streaks you knew which side they were on! I love your method! Hi Sarah – Don’t feel bad about your windows. Living alone here most of the week, I know what it’s like to tackle projects without any help. But believe me, once you get started…the job goes really quickly. And as an added bonus, you get to see the results immediately. Gladys Gilbert – Nice to read that I inspired you. Dragging a hose from faucet to faucet ain’t fun. But once it’s in place, you’re all set. I use the Windex system too and I love it. I grew up in Massachusetts with the old rope and weight windows, so it was sitting on the window sill hanging on for dear life to wash the third floor windows. I don’t miss them one bit. We also had blinds to wash along with all the windows. I don’t miss them either. Kevin I’m still stuck on the 57 windows!!!! I used to do all of our (older) windows, since I could reach them with nothing more than a step stool. It’s very different in our new home and I’m still working out a viable system. I may well try your approach, Kevin, once we get some rain to settle the dust. I’m amused by the timing of this topic, as I was gazing out over the violets in my kitchen window this afternoon debating whether I should at least tackle the interior window (and yes, I should). I flashed on your myriad windows, Kevin, and thought to myself “surely Kevin has someone come in to do the windows.” I’m impressed that you tackle them yourself. And yes, it’s critical go get them done before the short, dark days of winter close in. 3 of my 5 tilt in windows earlier today w/ windex, white vinegar & plain ammonia. What a beautiful home (and windows). I am putting this on my list of Fall things to do. Excluding my third floor but only 112 year old windows…those I can’t reach without a very very tall ladder. We have a whopping 4…yes, 4 windows plus a sliding glass door. That’s apartment life for ya! Fortunately, we live in a first floor walk out so I can get to all of ours no sweat. We make a glass cleaning solution of water, ammonia, Dawn and rubbing alcohol and use it inside and out. Dreaming of the day we have our own house and I’ll gladly take on the chore of washing all of those windows! This post is an excellent reminder to clean my windows! I do have the modern tilt-in windows… which is nice, but I only remember actually going in and cleaning them like… two years ago. Haha! I live in a very… dusty area [near a quarry] and we have really red soil… so my window screens are always covered in a red dust… It’s really hard to get a good clean on my windows!!! I was better at regular window-washing before life got busier. Now I usually hose the outsides of the windows once-twice/year to rinse off dust and salt from oceanside mist. The insides don’t done more than once/year, and I usually wait to do it until the end of rainy season in April. 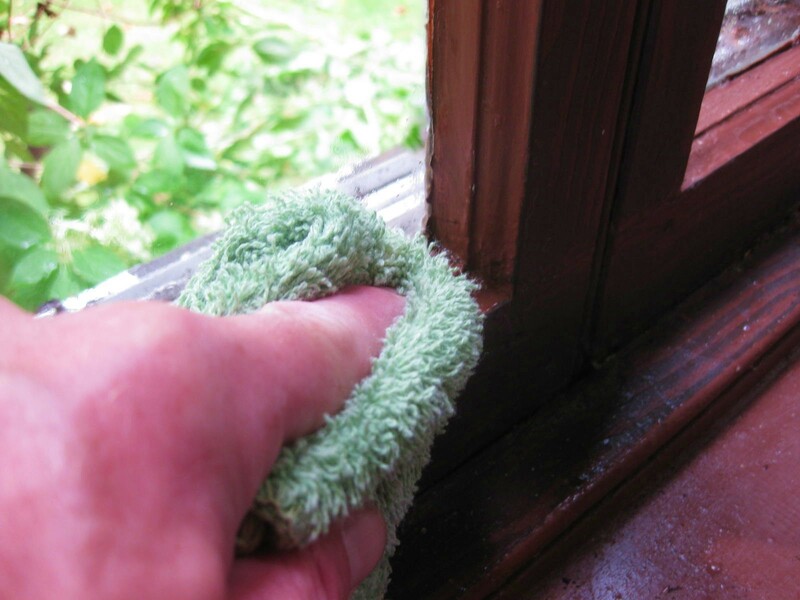 That’s the best time to wipe away the disgusting black mildew that forms on the interior window frames, etc. and the windows came squeaky clean…better than my windex, vinegar & ammonia. for some grain alcohol as a reward. Hi Dennis R – Thanks for the homemade “sudsy ammonia” recipe. And if there is any time to enjoy a cocktail, it is after a big window-cleaning job. Bottoms up! I cleaned all my windows using your formula, and I’m so pleased with how they turned out. I was so inspired, I even cleaned the inside both our car windows too! Windex also makes a product which is called Windex Outdoor. It attaches to your hose and greatly accelerates the force and reach of the water or cleaner. You spray with plain water, switch to clean and spray the solution, wait 20 – 30 secs. then spray water again until there is no more sudsing. The cleaner has a surfactant that makes the water sheet off and it leaves no spots when dry. I use it on my second story windows and have for many years. I’ve also used it to clean outdoor furniture and an indoor/outdoor rug from my covered deck. Thank you & love the recipe. I will absolutely give it a try. I’ve tried everything including the glass cleaner you attach to the hose. We have 36 windows ourselves. The insides are not a problem but rinsing with the hard well water we have leaves rusty spots. Any suggestions? What a lovely house ! . I finally got my outside windows done this year by a firm .I’m 70 and my windows all require a ladder too ,the back of the house is two stories off the ground. -not for me ,thank you . I’m convinced they used a solution similar to yours because they really sparkle. I’ll try it this winter when the inside gets dull. “Ya gotta “get a local young friend to teach how to clean windows like Sarah. Teach a kid a skill and they can make some $ with it .! This is just the motivation I need – especially considering I have never cleaned my windows and I have faaaaar fewer than you. I vow to enjoy the views from my spotless windows this fall/winter! …. Whaooo!!!! Thanks a lot … I gone to try this great idea with my windows. Geat post as always. I’m still trying to get fall mulch down on all my beds, then I’ll tackle my 64 windows. For the second floor windows I use the Windex Outdoor that is in a bottle that attaches to the hose. For inside and first floor windows I use Shaklee’s Basic H–wonderful, no streak easy method! I use Windex Outdoor for my lean-to greenhouse. We’re surrounded by hickory and beech trees that produce pollen seemingly by the ton! Both these pollens are sticky so a simple water rinse isn’t very effecive and are less than cooperative to the Windex Outdoor system. I have to get up on a ladder and use a very long extension pole with a soft brush on the end. Results so far have been underwhelming. I used to use ammonia and crumpled newspaper to clean my windows. After getting married, i got so much guff about the ammonia smell that I switched to vinegar. This fall I’ll try your formula and let the results speak for themselves. Thanks for a wonderful site. I look forward to your articles every week – like getting a visit from a special friend. I live in GA and have screens on all my windows. Anyone have good results withOUT having to remove the screens and scrub them individually?? I think I might try the Windex bottle/hose solution, if only to have the bottle to refill with Kevin’s recipe! Reading your blog inspired me to clean windows this morning and now they really sparkle. I try to do them fall and spring and your formula certainly made it a lot easier then before. I didn’t have sudsy ammonia but the plain seemed to work just fine. Thanks for the recipe. I’m a newbie to your website and have already found so much inspiration and great ideas for my own home, thank you! We have 64 original art glass windows in our 100 year old home. The pattern is somewhat intricate so there are a lot of little pieces of stained glass between the lead came. I’m wondering if this solution would be alright to use on them and what the best way to clean the small pieces would be. Any thoughts? Your house is enchanting!! I’m sure that cleaning the windows is a calling… and only someone that had the loving intention to curate and preserve could take on such an amazing place! You and your house are a treasure that I get to open every week…. thank you. I lives in an older home with lots of windows. We have lived here a little under 2 years. When I clean the windows, they still seem to have a “haze” on them in parts. Is it because they are old or because they were not cleaned enough in the past? Will your cleaning solution eventually remove the haze? I have always yearned to hire someone for my window cleaning. When I browse Craigslist and see people write “I need money fast. I will do anything” all I can think of is “Would they wash my windows for me?” I have 17 modern replacement windows in our 2 story home, some of which are prohibitively wide and heavy when bending inward for cleaning. My small hands are so totally wrecked up from gardening that I postpone the window cleaning chore as long as possible, over and over. It hurts to scrub back and forth, especially when my poor fingers hit the edge of the pane. This discourages me from the task. I do clean the windows that get room air conditioners installed because I could not stand looking out the reduced space and seeing grime and pollen. I read somewhere recently that extra clean windows lead to more bird strikes and bird deaths. The coating of dirt seems to alert the bird that it’s not a dark tunnel they can fly into. There’s a compelling reason to keep some dirty windows. In June, a cedar waxwing was killed flying into my largest window. The concussive noise was ear splitting. I felt terrible about this bird, yet I used the opportunity to see it close up and study its beauty, even in death. I still feel bad ! 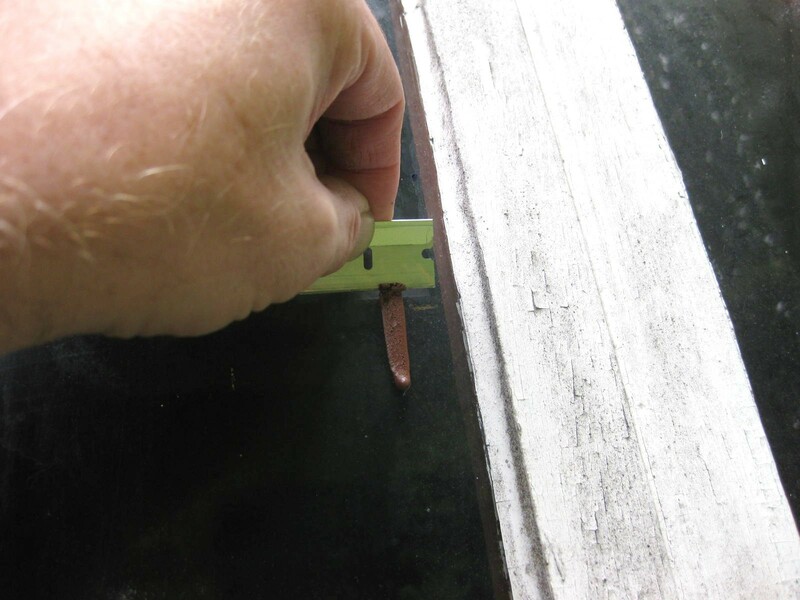 The razor blade trick also works well on windows that develop an algae coating, like my north facing garden shed windows with glass louvers. We love Mad Men too !!!! Can’t wait for the new release on DVD. 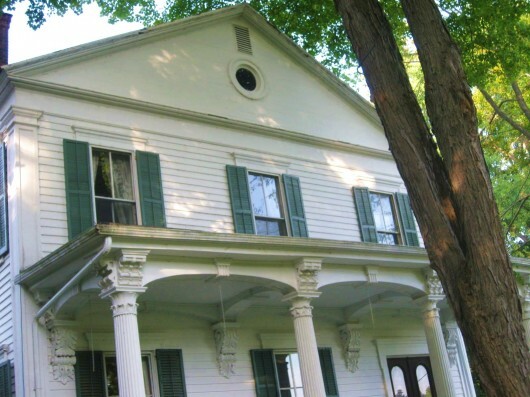 150 year old house – 39 windows just like yours. thanks for the solution tip! Beverly – You raise a good point about birds. I know there are decals for windows. The decals cling via static electricity, and serve as a “do not enter” warning for our feathered friends. So far the birds and me have been lucky…no kamikaze missions here. Kevin, I love the sunlight that comes through a sparkling clean window, especially when reflected off of newly fallen snow. Thanks for the instructions – i will try out the alcohol/ammonia solution this fall. One quetion – what kind of protection do you use for the foundation plantings around the house? Is the solution mild enough that you don’t worry about it burning your plants? Don’t tell anyone, but i’ve lived in my house for 4 years and NEVER cleaned the outside windows. I complain how dark it is in there and I don’t receive enough sunlight. I’m going to stop complaining and go do something about it this weekend. Thanks for the nudge. Beth – Neither diluted alcohol nor ammonia is harmful to plants. As a matter of fact, I use alcohol to keep my paperwhites from growing too tall! And diluted ammonia is absorbed by plants as fertilizer. So I use no protection for the plants beneath my windows. However, if you are concerned about your foundation plantings, my advice is to throw a plastic tarp over them during the window-cleaning process. Better safe than sorry, right? I live in FL and try to get all the windows twice a year. I have screens on all the windows and are always collecting spider webs in the screens (along with a lot of dead bug bodies)…any recommendations on how to keep the spiders away??? I’ve tried various sprays but it gets washed off. very unappetizing to see a wad of webs/bugs while looking out the dining room windows! Kevin – I used your cleaning solution and it worked great! I have a sun porch with lots of windows and they are sparkling clean! Thanks so much for another great tip! Love your website and news letter. OMG you are fabulous! Your recipe works beautifully, not only on house windows but car windows as well (another one of my least favorite) I washed/waxed/buffed our car this weekend and used your magic suds to do the windows. Perfect. 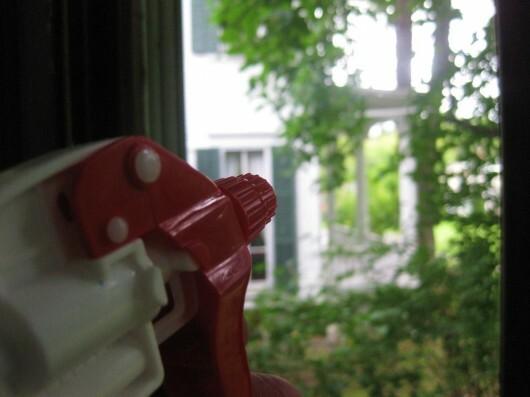 When we hired our window cleaner – he used foam oven cleaner for tree sap. He let it set a few minutes. For my reachable windows I found that the cloths by Norwex are fabulous. For my high outddor windows I use Windex hose end sprayer. Love your site. I live in a monterey pine forest..we have a horrible 6 week pollen season every year. Becasue california has little rain i save my rain water from the roof in an underground tank and use a hose fo spray all my windows wifh fhe soft rain water. no chemicals for outside windows and no streaking. the hose pressure washes off dirt and pollen and i have a 3 story house partially built in new hampshire to look like a colonial barn..many small windows but screens inside. For the inside i use this formula from a professional. one half tsp Dawn, one half cup alcohol and 3 cups soft water. Sometimes i add a little plain amonia. I use gallons of this as a general cleaner for the kitchne counters. and even on my toothbrush..no colds in 6 years. Recently i purchased a dry vapor steamer and have been slowly making my way through my entire house dry steaming and this includes inside windows and screens. It works amazingingly well but did have to spend a lot for the steamer as i wanted the dry vapor fype. I use no chemicals and use on mattresses and pillows but have to be carful on some wood.. I bought a Whitewing after reviewing the many brands. Hi Kevin! Glad to meet you! I had my windows professionally cleaned and picked up a good tip. After hosing down windows,use just a spritz of foam oven cleaner to rid your windows of tree sap. Make sure that you shake it well. Kevin, let me know about this. You have a GREAT house to try out this idea. Please let me know if it is a help to you. What technique do your readers recommend for cleaning the dirt build up between window and screen? The corners are impossible. Any helpful tool, brush or personal technique? We have a 100 plus year old farm house and have replaced all our windows with tilt in so no more ladders and changing screens to windows in the fall. I have found a product that uses nothing but water. They are called Norwex window cleaning rags. You wet one of them and wash with it. The other is a shiny rag and you dry with that one. You cannot believe how your glass shines. We have 15 windows to do and I just carry a pail of water and my two rags. no chemicals which can dry your hands or have to wear gloves. You can find these rags on line at Norwex.com. I have been a custodian for 31 years and cleaned alot of windows. streaks are maddening and i don’t find that at all with this product. enjoy!! apart from a few years of being married to a (wait for it…) “window cleaner” of all men, I have always cleaned my own windows. A few years ago I picked up a rather large steam machine with lots of extra tools. It looks like one of those canister vacuum cleaners. It’s terrific! the best cleaning tool I have EVER bought! 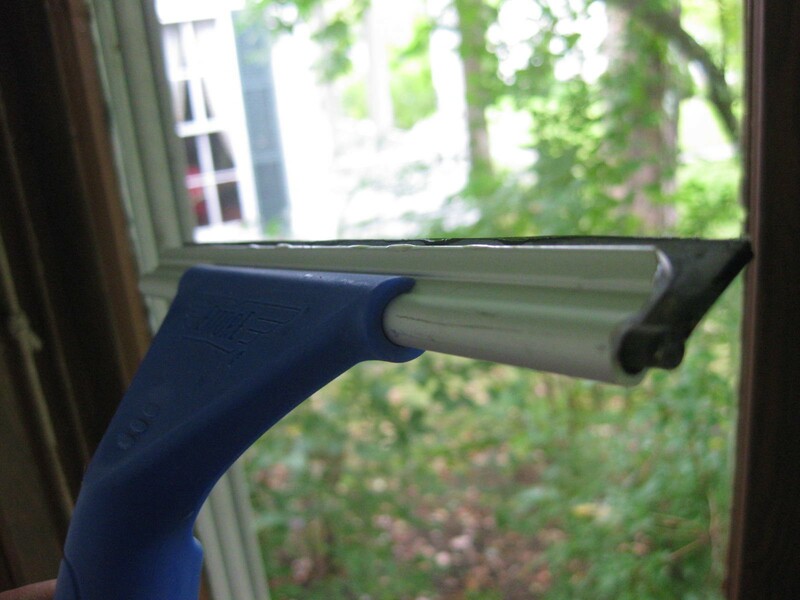 I love the squeegee attachment – it makes doing windows and mirrors a breeze! I have very hard water in my corner of Vermont, with many minerals, so to prevent mineral build up, I just add a splash of white vinegar to the reserve. My windows are the tilt in kind, and when I get around to cleaning them, they sparkle. For at least a couple of minutes that is…. then there are hand prints, nose prints, and doggy nose prints all over them again. BTW, according to the ‘ex’, who worked on many beautiful old houses in CT and NY, the best way to clean a window that had crud from old screens etched onto it, was with a spray bottle of murionic acid and a safety razor blade. There were many evenings he would complain about windows that hadn’t been done in a decade, and he’d been stuck all day at the top of a high ladder with a blade and acid while his father and brother got to do the inside and ground floor( probably why he’s ‘ex’). article. I’ll make sure to bookmark it and come back to learn extra of your useful information. Thanks for the post. I will definitely comeback. I am just so inspired and motivated now. I live in an old house, one story, and my windows look just like yours. The only difference is that they have storm windows over the outside. I am almost 70, and running low on energy, but I am going to try to at least clean some of them. Some of the storm windows don’t want to go up and down. I am thinking, WD-40. 🙂 It’s going to take a while. I’ve always used the sudsy ammonia and vinegar but until this article never thought about adding rubbing alcohol for the streak-free drying — what a difference! Thanks for the info! Who knew there could be so many thoughts/discussions about cleaning windows!? Years ago I found a recipe for window washing using hot water, ammonia, white vinegar, and a small amount of cornstarch to act as a surfactant. On with a sponge, off with a squeegee – great results. I recently starting substituting a few drops of dish liquid for the cornstarch, and use a microfiber cloth to wipe the squeegee & and drips on the sill. I can’t imagine trying to tackle those huge windows like yours! I just bought and old house circa 1898 and some of the windows in one room have a haze to them that appears to be on the inside. I just cleaned them using a store bought cleaner. Do you know if your “recipe” will remove this old haze? I hire a local one-man shop window washer every spring. I’ve used him for over a decade, and he never disappoints. He uses only water and a little dish soap, and a squeegee, and the windows sparkle! Speaking of windows, we have found that Sprayway’s “World’s Best Glass Cleaner,” does an excellent job on mirrors, glass, and our smooth cooktop — much better than the other big-name glass cleaner. It looks like a big can of hairspray, and it’s available in our grocery store. I live in Costa Rica, in the mountains, and am a fanatic about clean windows! I just cannot get enough of my view, and hate to have it marred by dirty windows. I just did them yesterday using the water, alcohol mix, but since I didn’t have the sudsy amonia, i used a drop or 2 of Dawn detergent. Worked like a charm! I can reach most of my windows from the outside, so alternate between a sqeege and microfibre clothes. Inside, especially, I prefer the microfibre. Thanks for your wonderful articles. I always look forward to them. I use a 50/50 mixture of water and ammonia, and add a splash of vinegar. I use a reversible sponge, the kind with the soft scrubbing side opposite the regular sponge side. Or I use an old t-shirt. I wash the windows with the cloth or sponge, and wipe them dry with more old t-shirt rags. The vinegar eliminates streaks and like yours, the windows just sparkle. However, I think I will incorporate your idea of hosing them off first, so I can get the bulk of the dirt at the tops and bottoms off first. I prefer rags for drying because squeegee blades sometimes send water in streaks down the side of the house, which can be quite noticeable if the siding isn’t clean. Thanks for your article; I found it very helpful. Kevin, does this method work on hard water? We have terrible water out here and haven’t yet installed a water softener to our well. I’ll probably employ the indoor method outside, as well. We are in a terrible drought and I would feel wasteful washing windows. Sorry, in a drought windows are low priority as far as hosing goes. Two large picture windows will be the test of your solution today. Perfect weather for outdoor chores. Thanks. My little wee granddaughter loves to clean windows. She noticed a tiny spot on her upper floor bedroom window, and guilted MoMo (thats me) into a faulty towers rendition of soapy water window washing. We had a ball!! Your husband is very lucky to have you Kevin, as are all of us for your brilliant and hillarious sharing. Love you! Years ago, WINDEX came out with a window cleaner called WINDEX OUTDOOR MULTI-SURFACE cleaner. Since I have a 2 story home and cannot climb ladders, I have used this with great success. It is the same principle as their new ‘mop head’–without the handle tool. It just attaches to the hose and has a dial to switch on the water–then cleaner–then water again and washes without towels or newspapers. Thank you for you indoor solution ratio. I’ve been using your technique and homemade solution for a year now and I have to say, it is THE best way to clean windows. It’s fast and the results are wonderful, shiny windows. In the past, I’ve used newspaper, various commercial sprays, paper towels, cloth rags, vinegar, etc. Nothing works as well as your solution. I love clean windows and this technique is the BEST. THANK YOU ! THANK YOU! We live next to a wildlife refuge wooded area that’s mostly hickory, oak and beech trees. In the spring people from this area drive yellow cars from all the pollen, so window washing is a real challenge. I’m the window washer and cannot over-recommend Kevin’s formula for cleaning. This stuff works! Regardless of how careful I try to be, seems there’s always a streak or blob that I’ve missed on the outside of the window.. Have discovered a sneaky trick to help find it. When you back inside to inspect (admire) your work, take a dry-erase marker and circle any offending smudge. Makes finding the spot a lot easier and a quick s wipe on the outside removes it. The dry erase marker is no match for a paper towel. We used to have a lot of bird casualties from the little guys trying to fly through the glass. One year I buried 8 songbirds and decided the stick-ons I was using simply didn’t work. Solved that by cutting a sheet of mylar gift wrapping with a hologram pattern into strips and taping them near the top of the wood-side windows that had the casualties. The mylar is almost constantly in motion so between the sparkles from the pattern and the motion of the strips we have not had a single fatality since. It took only a short time for us to get used to the strips but after seeing a wood thrush do a quick turn to avoid the window, the fluttering strips are now a welcome part of the scenery. You didn’t mention screens in your column. Do you have them? 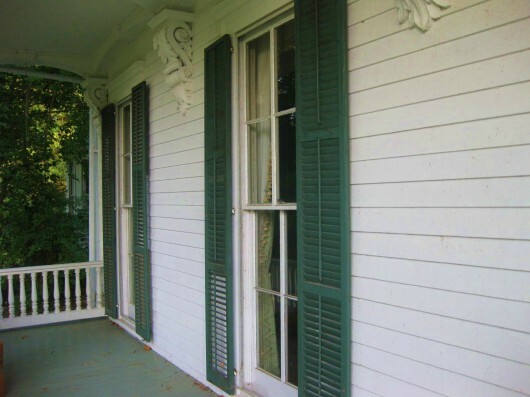 I bought an old house that has the original wood and rope/weight double hung windows. They’re lovely–or would be except for the ugly storm windows the previous owner installed. Now I’m debating what to do about them, in addition to cleaning. Any ideas? Kevin, As Sarah says I live alone also and my loving Nephew has threatened to take my ladder home with him if he catches me on it again!!!! With bad hands and knees I am really hesitant about climbing so my outside windows suffer but the inside is not quite that bad. Am going to try the garden hose and wash with the ammonia mixture – thanks for your help. Kevin, It’s me, Cathy, again! Do I see two beautiful grand pianos in your picture? Do you play, teach, or both? My house was built in 1883. I have 52 windows. I hire it out to clean both outside and inside. Best decision I ever, ever made! Hi, We have a service here in Raleigh – Major Paynes! They are inexpensive, clean inside and out, both floors. It’s about time to call them. I have them come once a year in the fall, after the pollens have done their thing! 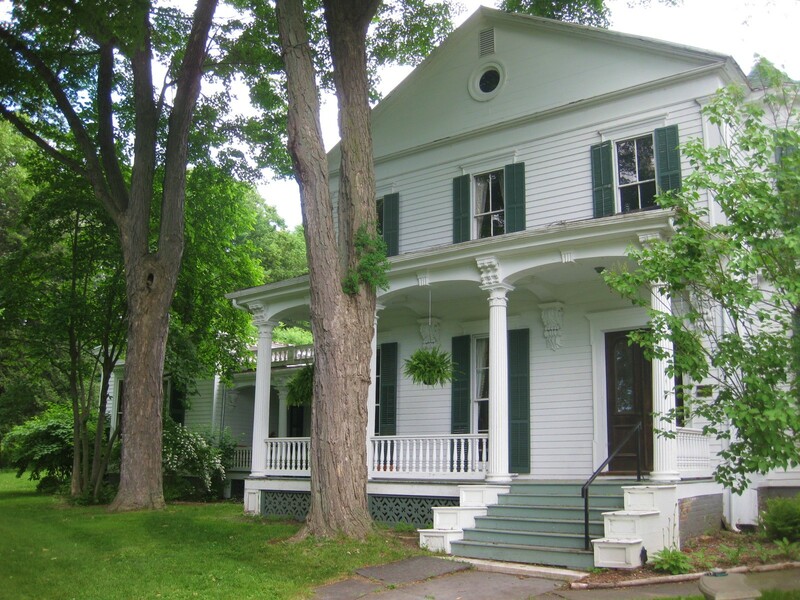 Love your old house and this site, too! For me the answer is neither. They don’t get cleaned because you can’t tell the difference after they are cleaned. I have people coming Friday to discuss replacing my 31 yr old windows. Double glass in the windows sounded like such a good idea when this house was built but they have all failed. There’s either moisture or spiderwebs between the 2 layers of glass on every single window. I’m so excited about the prospect of actually being able to see out my kitchen window you’d think I was getting a brand new house. Here in Alabama the pollen has not nearly finished. Ragweed is blooming and all us allergy sufferers are never far from the box of tissue. Get down to the hardware store and get one of those wonderful long poles the painters use to paint the sides of buildings. They are not expensive and adjust upwards of 10-20 feet, which should be just enough to reach to tops of those windows. I found one on Craigslist for just a few dollars and it made washing the second story windows so much easier. I like your solution for cleaning, I’m going to us it next time. Thanks for the formula. I’ll use that information. Totally agree regarding uselessness of vinegar! Our 102 year-old house has 58 huge, double-hung windows (all with storm windows) and an additional 26 decorative windows and doors. Sadly, even when we hire someone to wash the windows, they are never all clean at once. The house is 3 stories in the front and 3 1/2 in the rear. It over-whelms me to think about doing the job alone! I would much rather live with dirty windows than replacement windows. My older home, about 94 years old now, has double hung windows also, but each is a 6 over 6 or 8 over 8 window meaning the windows are divided into cute little rectangles. So cute that I have to use a hand wiper or find a small size squeegee to use. At least the storm windows are not divided up like that. BUT, the storms have to be stored for the summer and brought out and re-installed each winter since they are double and not triple track type. It’s an ordeal to do the windows each year but I start early and carry on until all are sparkling clean. Like you, I want the sun to blaze into the house all winter long. Meguiars car wash and an extension swimming pool cleaning pole (mine is a 20′) with a soft car wash brush attached. The Meguiars soap i put in a 5 gal bucket with water (follow car wash directions on mixing) to dip the brush in. Hose the windows down first. I can reach my tallest windows while standing on the ground except the attic. Those are really high so I open them on their hinges inside and clean them that way. The car wash leaves my car spot free and has ‘sheeting’ action, Same with the windows. They too dry spot free and sheet clean. As far as washing your car, this brand is amazing. 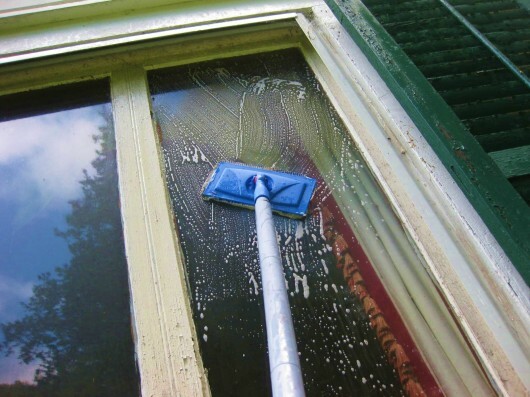 I use water, rubbing alcohol, non-sudsing ammonia and vinegar – my windows sparkle!! Love the rubbing alcohol in this – no streaks! Living on a lake (in farm country) our windows really get dirty and this does the trick every time! If we get a warm day in the winter I can use this formula and it works like a charm! For the windows that have no screens, I made “bird deflectors” – using “fish line” and tiny mirror tiles I hang these in the windows. Only had one bird hit my windows this season!! I’ve switched to your 45/45/10 method which works so well on all my windows, this is the best cleaning solution for me. Monsoon season is almost over here in Arizona (it’s still 100 degrees); window cleaning will happen in October. I have found a couple cleaning cloths that you do not have to mix any chemicals to clean with. Just a bucket of water and the two cloths. They are Norwex and you wet the one and you dry with the other. No streaks. I used to climb a ladder to the second floor windows, take off the screens and scrub. We went to the expense of putting in new tilt in windows and what a time and life saver. Have 18 windows and those two rags do the job. Worth the money!! Kevin, All I can say is you’d better bottle this solution a it is Oct 19th and chilly but I cleaned all of my windows with your solution and they are amazing! I have never seen them look so great. Wasn’t sure so on the inside, I just sprayed them down first with clear water in a spray bottle then sprayed the solution and squeegeed them. Now I just have to worry about those darn birds flying into the windows as they are sooooo clean! LOL Thanks so much for a great recipe and it was so easy. I also have white shutters on the house so sprayed them down also then applied your spray and scrubbed them with a brush and rinsed. Amazing! Thanks again. I never post comments, but this time I have to say “wow!” this really works. I have a hundred+ year old house, plus I am busy and a bit lazy. I zipped through cleaning my windows, and this didn’t make a mess, which I expected I’d have to clean up. Thanks! Lovely tips! We just moved to an old Victorian style house and I’m about to finish with the cleaning of the house. Few things left only and the windows are one of these things. I’m not int window cleaning at all (my mother always helps me), but it’s now time for me to get to work. Thank you for sharing all the useful information. Greets! Lovely tips! but I just want to know the tips for out side dirty windows with thick stains of rain water, and windows are out of reach as well, and the ladder can not be adjusted to some widows. Nobody has clean the windows since last 25 years, can you help me please in this regard? If you don’t have sudsy ammonia,you can use Dawn Dish Soap. I use a couple of teaspoons of Dawn, 16 oz of Rubbing alcohol and 1/2 cup of Ammonia in a gallon jug of water. Then I put that in a spray bottle. When I had a two story house I used a hose end sprayer to get the solution on the high windows. Dawn has the added advantage of being a surfactant which makes water wetter. I just slides off the outside of the windows. What a coincidence as planning to do my windows today. In the past I have used a windex spray and then a vinegar solution but never really happy with my clean (?) windows! Shall see if I can get the sudsy ammonia and try your solution. I love your blog. Yep I clean my own and hop out onto the roof like you and clean with a squeegee! It’s pretty fast once you get started. I just use the spray bottle and go to town ! Manufacturers’ instructions for newer windows with the coating to filter ultraviolet rays suggest warm water with dish detergent as a cleaning solution. I haven’t tried this yet, but I don’t want to destroy the effectiveness of the windows with ammonia! I hire a great guy to clean my 18 windows and glass sunroom. Omly $300 well worth it. Cleans screens too! Wow! 108 replies about windows, who knew. We have a similar window system with a great looooong, pole attachment. Gets the vinyl siding nicely. Have try the recipe of soapness. Fortunately we have 14 sliders and 3 windows. In nc nothing stays clean for long. Cheers to windows and great cooking! My windows have 6 panes on the top and so I have to do all 10 porch windows individually, and remove the screen on each. Any suggestions on how to speed that process? That said, I don’t do it very often, as it is such a pain! Love your website! I’ve been using the vinegar/newspaper method for too long with too little results (and ink-stained fingers!). Thank you for both the inspiration and the recipe. I too did the windows with my “white glove test” mom using the same up down and side to side technique. So now I do that with the first floor windows. It’s a lot of back and forth with one person. I hire out the windows for the second floor every November and the team also cleans out the gutters. Thank you for the “sudsy ammonia” tip. i will be giving that a try…yes, I clean my own windows although the ones 3 stories up are mostly cleaned by Mother Nature when she gets in the mood for a heavy rain with winds coming from that direction. The windows that make me crazy are my newer double glass ones…some kind of off-gassing occurs between the two panes and even thought they come apart (sort of like opening a door most of the way), they are really hard to clean and get streak-free. Have a wonderful and bountiful summer. Just finished cleaning my windows prior to putting the house on the market. I use your formula w a dash of Dawn ( only blue or green). For those hard to reach corners on the outside of the frame I use a broken popsicle stick. Use the broken ends like a small brush and scratch away at the buildup. Then use a small paintbrush to brush to sweep the debris away. Repeat if necessary. It never mars or scratches the vinyl​ or painted surface. Kevin, I never thought about best time to clean windows and have been cleaning them in the spring after the pollen settles. Now I’ll do it in the fall too, as I don’t have 57 windows and they’ll all on the ground floor. I think your method is ingenious and I’m sure it get those windows sparkling clean. For now, on the inside I use the Lazy Susan method which is inexpensive cleaning towels from the dollar store, soaped up with a little dish soap. Clean the window. Rinse with hose on outside. On the inside, rinse with another cleaning towel that has only water, no soap. Done. I love your blog and thanks for the timely article! I have similar old windows. I see that the article was first posted in 2012. Are you still able to obtain the Windex pads? With some trepidation, we hired the same team that our lovely neighbours use . I abhor spiders and we live by the river which seems to encourage spider infestations. (They drop down from the trees and creep me out, and used to make their way into the house partly through the skylights when open. ) The team of young men spray our soffits and all 16 door-sized windows with pyrethrin for spiders and then they wash and squeegee all of the windows. Our interior is now spider-free and the windows gleam. I am happy! My windows need to be cleaned several times a year with the woods close to the house. So much filth and gunk from trees. We have to use a pressure washer as well for the second story out of reach windows. No porch roof to go out on! Going to try your recipe for cleaner for the inside of the windows. I envy you with your “real windows”. We needed to replace ours and got the vinyl….. hate, hate hate them! They just look tacky in my home. It’s a long story. Sorry. I’ve tried to clean my windows. Before I owned this 1930’s house, someone installed storm windows, which makes window cleaning difficult. I called a company to see if they would clean them for me. I offered to pay (choke!) 1K for the job. They looked at the job & refused. They said the storm windows might break if they took them down and the process would be too slow. They said there was no way to remove the individual storm panels. (Not true!) I told them I’d sign a contract stating they weren’t responsible for breaking any glass. They still refused. They also refused to do my neighbor’s windows for the same reason. No window cleaning company would touch the job. I found an on-line video showing how to remove the individual storm window panes to clean them, and it worked for mine, but it was a slow process. The handyman I hired to help me wouldn’t help. He refused to help clean them. He refused to put the ladder where I needed it. He said he’d remove all of the storm windows on one day, let me clean them, and then would return the next so he could reinstall them. He actually wanted to unscrew all of the storm windows and I didn’t want to do it that way. I gave up. My house is a circa 1775 Georgian with the original windows. Unfortunately, the upstairs is hard to clean because they pre-date chains and ropes to allow the top sash to move. The top sash is fixed, so I can’t hang out on the 2nd floor as I’ve always done in my 1920’s houses. Consequently, I use your method with a pole, ammonia, a ladder, and a hose twice per year on the 2nd floor exterior. Every 2 years or so, I hire a window washing service. I do wash the interior windows every quarter…I like clean windows. Recently, however, I’ve tried a new product for the 1st floor exterior and all the interior windows that I’m really happy with – it’s a spray called “Dirtex”. What I like is that it seems to soften paint on the windows and makes it easier to remove with a razor blade without scratching. Also, it cleans and polishes the window, keeping dirt from clinging to the window…or at least it seems like it does. The windows really sparkle when I’m finished and it doesn’t even look like there’s a window there at all! Pretty good for windows this old! However do you have a solution to deter the spiders who hide in our window frames from instantly doing their business as soon as we have cleaned the windows? You would be our friend for life if you have an answer to that one! How brave you are to tackle this huge job. Be careful! Nothing like clean windows. Who knew there would be so much interest in window washing! I’ve always done my own except for one house that had extremely tall windows I couldn’t reach, inside or outside, so I hired that out. I’ve used your formula and it works great. But, for outside, I like the same Windex Outdoor Glass Cleaner that someone else here mentioned. You hook it to a hose, spray with plain water, then turn the dial to sudsy water, then spray again with clear water. It’s especially great for hard-to-reach tall windows. I like to do it twice a year – can’t stand dirty windows. More often for inside kitchen windows. I’ll try that sponge. Thanks for the tip. I clean my own windows too. My home is only 75 years old and its main architectural feature are the 14 original mult-12 pane each (6 over 6) windows and the two 40 and 25 pane picture windows. So, even though they are a pain to clean, I refuse to replace them. Oh, did I mention, each has 2 track storm windows/screens too so that makes double cleaning each time. Living on the river, it is the nuisance cobwebs that develop between the windows and storm windows that act as my initiative to clean my windows twice a year. Just finished cleaning all my windows after having the house painted this spring. Enjoyed reading all the comments. After 33 years of cleaning these windows, it’s about time to invest in a very long clean pole and stay off the ladder. Kevin, you need to think about purchasing one too! Hi, Master Windwasher! You couldn’t have done this at a better time! We’re going to be doing summer entertaining..I won’t wait until fall to do the windows, but attack them soon. Pollen is gone, but the dust from the lawn moving is a problem. I’m jealous of your wavy old glass, and also because you have the cleaning done!! Thanks for sharing your tips. Kevin – environmental impact on the “45% water, 45% rubbing alcohol, and 10% sudsy ammonia” solution? I know you wouldn’t do something that was bad for the environment but I am just wondering about ammonia and another readers suggestion about Dawn DW liquid as an additive. Thanks for your thoughts. Our home in Mt Shasta (No California) is perched on a steep hillside overlooking a beautiful lake and the Mountsin. Gorgeous but we get high winds and windows get very dirty. The house is an ultra contemporary version of the ‘window challenge’ you experience with your lovely old home. Tried your concoction and it worked just as well as hiring a professional to come out with his cherry picker and do the job by hand. Thank you, Kevin!!! quite as good as I would have liked. Oh well! Kevin I have a quick question. My mom’s friend gave me some peonies that unknowingly came with “goutweed”. It is in absolutely everything in my garden now. Each year I pull and dig it up. I am getting so tired of this. Any suggestions? I know Round Up is bad but I have even tried that. No luck. Any advice would be appreciated! I remember climbing out the window and standing on the sill while Mom would hold onto my legs to wash the top outside with the string mop. Then I would sit on the sill and wash the window with the window holding me in place. When I bought the house I used scaffolding . Mother in law uses to new mop you are using. She likes it very well. Now my landlord washes the outside windows once a year for me. I’ve looked everywhere in my city and near buy but there is no sudsy ammonia to be found. Could it be a regional product? I’ve been assured by merchants there is no such item, I live in Michigan. We try to do our widows twice/y. Once in the spring after the cottonwoods stop…. “cottoning” and once again in the late fall. Hubby does the outsides while I go around and do the same windows from the inside. That way we can open them and get the gunk off the sills. Mr Clean with a squeegee finish on the outside. Started using the cloths from Norwex for the insides with JUST WATER. It has changed my life!!! I just used this on my windows!! It’s wonderful. I did use dishwasher soap as I couldn’t find sudsy ammonia in my stores. I’ll use it from now on. My house is only 10 yrs. old and have the pull out windows but some are 8-9′ wide but this still made it easy and they just sparkle. So glad I joined your news letter. Stay cool. It’s hot here!! Hi C. – So glad this method worked for you! Kevin, I have never been happier cleaning windows than I was after using your solution! Can you use this cleaning solution for crystal lamps, too? Any tricks to offer for that chore? Thank you so much for the window cleaning recipe! Like you, I have an old house with big windows. The solution works beautifully inside and out. I can’t say I like cleaning the windows, but now I hate it much less. Memorial weekend – spent with family playing Phase 10 and relaxing. In the past I have always cleaned the windows in my 1747 farmhouse (in Orange County) but last year I vowed “it was the last time”. This year true to my word I hired a professional cleaning company (some ladder work was needed), screens and doors while I tackled the inside windows. Kev it was the best $400 I’ve spent in a long while! And I swear they have kept cleaner longer than if I had done them. I will try your window cleaning recipe for the interior windows but I’m sold on getting professional help for the exterior from now on! Ps I’m in my mid seventies, in good physical condition, but enough already! I wash my own windows. For the outside I use a mixture of clear sudsy ammonia, drop of Dawn dish soap,and water. I mix it in a dish pan and apply with car type squeegee/scrubber duo expandable handle. My house is one level (thank goodness). The inside I use glass cleaner and paper towels. I am going to try your inside version before winter. I live in central Washington, and tackle the outside windows a few times a summer because of the dust that blows. I love clean windows. In the last few years I have started using the Norwex window cloths. Very good but with the amount of windows you have, probably not practical. I would like to point out that if you have newer LOW-E glass, you should not use ammonia on them. I hope your fans are aware of this. My husband and i clean our windows together as a bonding process. He does the outside with soapy water and a squeegee and i follow around the same windows and do the inside with the Norwex system. Love norwex for the inside,but will look into the soapy amonia you mentioned for the outside. When I was a kid, it was often my job to clean the windows on the outside of our house. One story. I complained vociferously, but I did a good thorough job, according to my mother, who was a major task-master. The method I was taught was first, hose. Then prepare in a plastic bucket, half warm soapy water, half white vinegar and a quarter ammonia. Then use rubber gloves to protect hands. There were no squiggies back then so I used old rags. The results were some of the few compliments I received from my mother. Now, I farm out the job to a nice, healthy male student. But I prepare the buckets and he finishes with a squiggie. Twice a year. Just cleaned the 31 windows in our old house. Don’t mind the actual washing, even when it involves taking down the big old wood storms. (and I love the old wavy glass!) The part that challenges me is taking out and putting back in the combination storm windows that we have on some of the bedroom windows! Why must they be wrestled with so? For a few of our windows, I stand on the porch roof. For some, I sit on the window ledge, with the window closed in my lap (this is how my mom used to wash our windows in the top floor NYC apartment I grew up in) Happy to have the job done again. Yours look wonderful Kevin! Thank you for the tip! Mad Men! Oh yeah! I binge watched the entire series in one summer! Loved it!! It’s a treat to see what you have to say every week! As soon as I find colored spatulas, I’ll be able to try some of the recipes myself! I am the first-time homeowner, as of April 2017, of a house that was built in 1932 that has the original glass (35 windows, about half are 6 over 1, plus screens and storm windows over everything). I haven’t cleaned them yet! I had no idea where to begin. Thank you for the magic formula (that I can already see other uses for as well), and I thank you and the rest of the posters who have embarrassed me with the scope of their/your labors! No excuse for Poor Me! I was joking about the spatulas. Uh, that would be porch ROOF, not ceiling, unless you’re set up to do that Fred Astaire stunt!